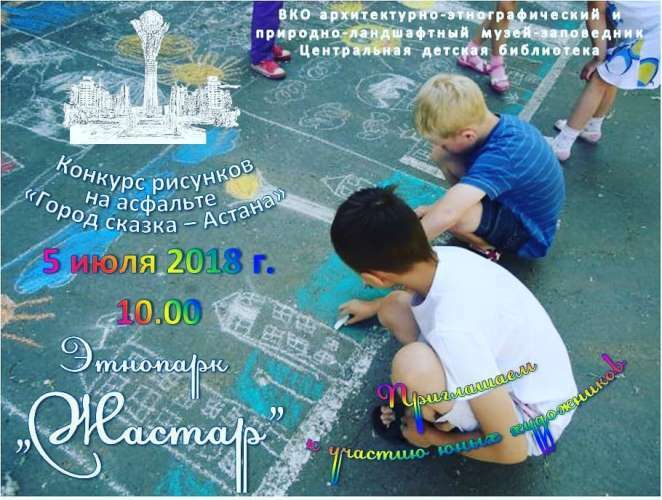 On July 5, 2018 at 10.00 on the territory of ethnopark «Жастар» the Central children's library (54, Gorky street) together with East Kazakhstan regional architecture-ethnographic and national landscape museum reserve in the framework of theatrical show «Город-сказка - Астана» holds a drawing contest devoted to the 20-th anniversary of the capital of our Republic. Every young artist can present his vision of the modern capital, take part in the games and competitions, get acquainted with the book exhibition «Астана – сердце Евразии». The best works will be awarded.